Developed for the U.S. Armed Forces to clean M16/M4 rifles quickly and effectively and get them back into action. 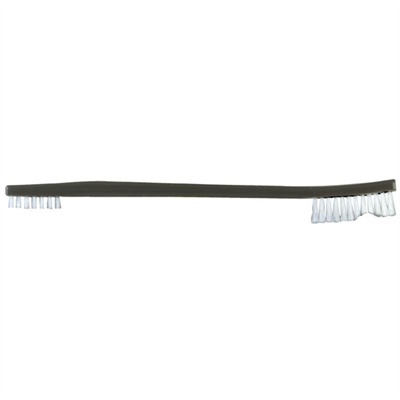 Double-ended, solvent-proof, polypropylene handle provides a large, contoured series of nylon bristles to cover curves and open areas, while the short, extra-stiff, narrow line of bristles tackles the really tough crud in those hard to reach areas. Gets down inside actions, pistol slides, around the extractor star on revolver cylinders, plus provides superior scrubbing action for individual parts and hard-to-reach areas on shop machinery. Enough bristle backbone to remove greasy gun dirt, yet won’t scratch delicate blued surfaces. We’ve used them with d’Solve™, EZ-Soak™, WD-40, Hoppes bore cleaners, and a host of other solvents and oils on everything from fine custom rifles to neglected, black powder guns. An exceptionally good, practical, cleaning brush for use at the bench or in the field. SPECS: Handle - Solvent-resistant polypropylene, O.D. green. Bristles - Nylon. 7" (17.8cm) long. Meets Mil Spec 129J, NSN# 1005-00-494-6602.